CULTURE INCLUDES: lactose, (LLC) lactococcus lactis subsp. cremoris, (LL) lactococcus lactis subsp. lactis, (LLD) lactococcus lactis subsp. biovar diacetylactis, microbial coagulant enzyme. YIELD: Each packet will set up to 1 quart with a yield of approximately 1 pound. DIRECTIONS: Heat 1 qt. 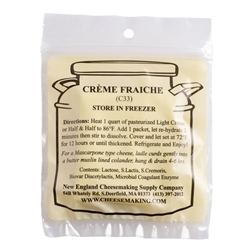 pasteurized light cream or 1/2 & 1/2 to 86ºF. Add and mix in 1 packet, let set at room temperature, undisturbed, for 12 hours or until thickened (as in yogurt). For a thicker texture ladle the curd gently into a butter muslin lined colander, hang and drain 6-12 hours. Refrigerate and enjoy! DISCOUNTS: If you really love these you can buy 12 or more (5 packs) and you will receive our price break of $4.95 for each 5 pack.